decisions. Some struggle with this for years. experiences of other managers who have been interviewed and observed. do a more effective and efficient job at managing people and tasks. 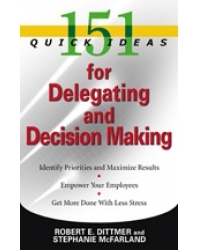 Robert E. Dittmer, APR, is author of 151 Quick Ideas to Manage Your Time. delegation skills. He and his wife live in Indianapolis, Indiana. Stephanie McFarland is an 18-year veteran of the public relations profession. and her daughter live in Indianapolis.